1) Did I spell that correctly? Why does the A come before the E. Freaks me out every time. 2) I went to Waldorf elementary school. Our teacher was a wild story-teller. All of our history lessons would be told to us in magical life-like stories, and for this reason I remember most of what I learned there to this day. I still vividly remember him acting out Julius Caesar’s assassination and colorfully exclaiming “Et tu, Brute?” For this reason, when I am offered a Caesar salad, I find myself mumbling “Et tu, Brute?” to myself. Nope. Not awkward at all. I might have also said that to a waiter once upon receiving my Caesar salad. He didn’t get it. Tough room. 3) Haircuts. Julius Caesar is depicted in many a statuette and paintings sporting a look that would later be brought back by the lead singer of the Backstreet Boys. Everybody…Rock your body. Don’t believe me? 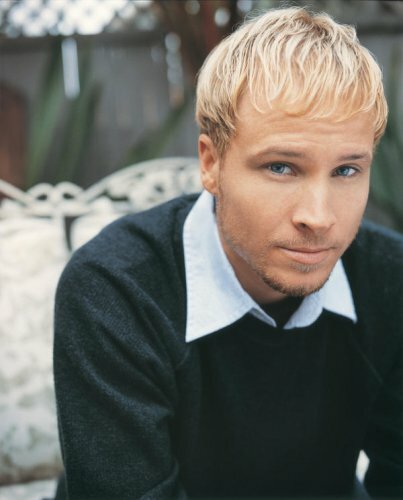 Just google image search”Julius Caesar” and then google image search “Lead singer of the Backstreet Boys”. BAM. Trendsetter. 5) Caesar Milan. Dog Whisperer. Leader of the Pack Mentality. 6) Oh, yes. Salad. DELICIOUS! Welcome to my true life crazy brain. I still fantasize that I will say that someday over a Ceasar salad and someone will laugh. That person and I will be best friends. Obvs. This probably won’t happen. I should probably stop trying to make it happen. Okay. I am done. 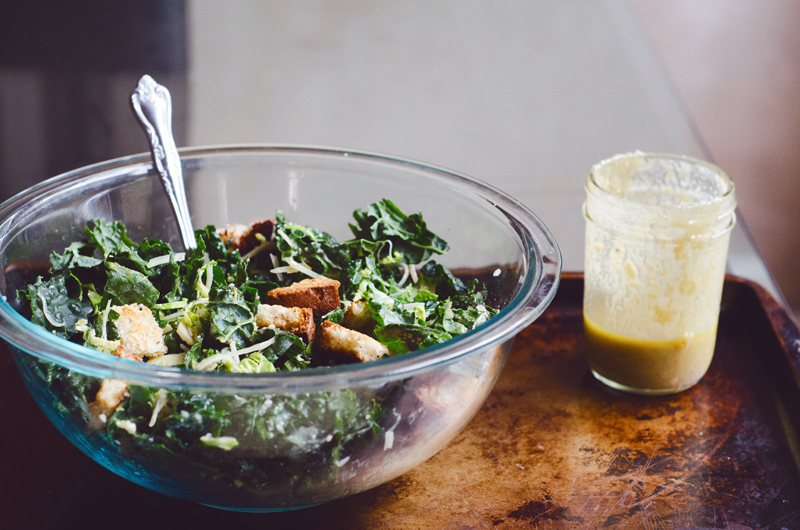 Funny thing is… the Caesar salad has nothing to do with Julius Caesar. At all. This just makes my antics all the more awkward. Read on. Today I bring you a powerhouse of a salad. 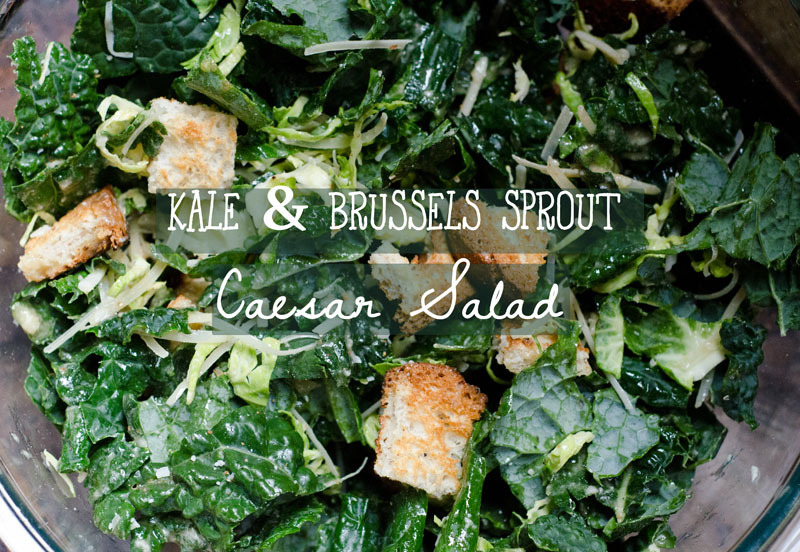 We are leaving behind the traditional romaine for a hearty and nutrient rich kale. There is some added crunch and texture from some shaved brussels sprouts and of course a nice creamy dressing, some cheesy goodness as well as some toasted up croutons. Yum. Set your oven to 350 degrees. Start by washing, drying and de-ribbing your kale. Chop it up, and put it in a large salad bowl. Wash your brussels sprouts, and either thinly slice them by hand or run them through your food processor with the slicing attachment and add them to your salad bowl. 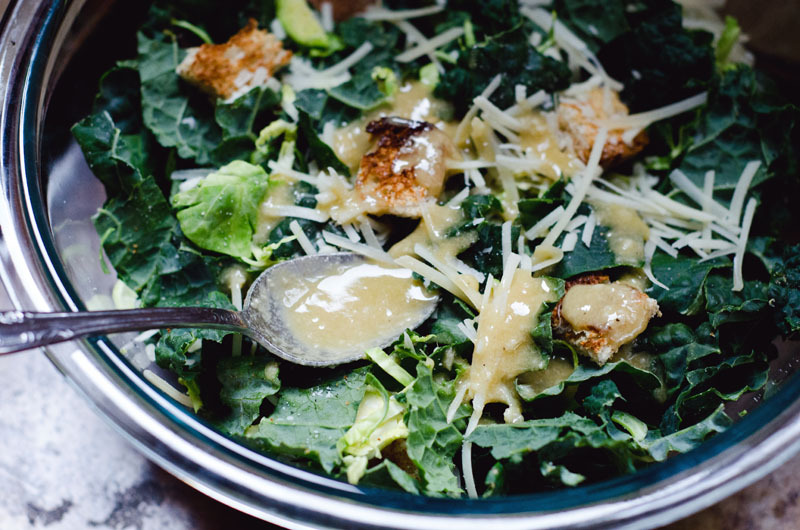 Add the parmesan to your salad bowl. Place two pieces of Udi’s gluten-free bread onto a baking sheet that has been lightly greased. If you want you can spice up your bread a little bit. I added granulated garlic to mine. Allow bread to toast until it is golden brown on both sides. 2-3 minutes. Keep an eye on it so it doesn’t burn. Remove from oven and allow to cool slightly. Cut it up into crouton sized pieces and add to your salad. For the dressing, add all of the ingredients into a blender and process on high until they’re thoroughly combined. You might have some leftover dressing, depending on how dressed you like your salad. It should last for a couple of days in the fridge sealed in an airtight container such as a mason jar. Dress your salad with your desired amount of dressing and toss it well. You can even massage it into the leaves using your hands in order to soften the kale a bit. Add some fresh cracked pepper to taste, and enjoy! funny! I’ve never made my own caesar dressing… anchovies freak me out… I think.. I’ve never actually seen one. Yum! I will be subbing crispy bacon for the bread crumbs, because I’m boss like that. Hi! Ohmygosh, I’m new to your site and absolutely lurve it! Okay, just had to tell you that I made this dressing tonight for a chieken caesar (and this was my first time EVER making a caesar dressing), and it was soooo delish! Better, it was wicked easy. I’m never going back to store bought again. Thanks for the quick and easy recipe, and I’m loving your posts. Cheers!